One of my goals for January was to get organized! Eek! I figured I better hurry up and seize the day, so I headed to Lowes to pick up a few things. I don’t usually think of Lowes as a place to shop for decorative storage baskets, but they definitely have some lovely options that put the “fun” back into functional! I especially liked the look of these galvanized locker baskets and thought they’d look uber cute in my boys’ bedroom. Obviously everyone else at my Lowes liked them too because they were almost sold out. 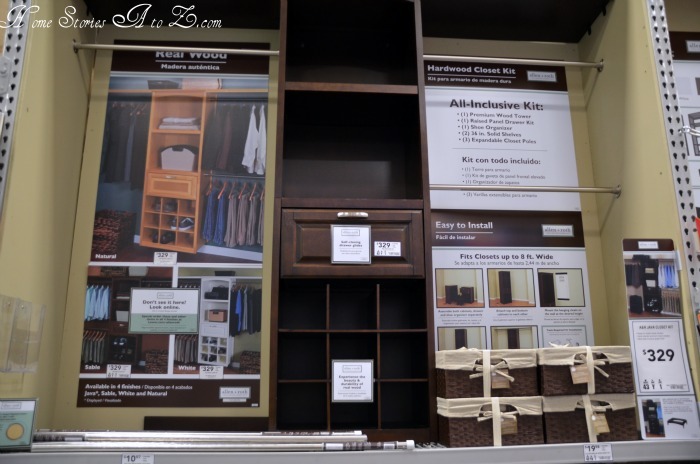 And although I am so not a fan of the wire rack closet organizers, I was pleased to see that Lowes offers some fun slide-out basket storage and custom add-ons. If you’re stuck with wire racks, this would definitely be the way to go. Ooooo, the wood closet organizers are so pretty. I wish I would have splurged on some when we remodeled our home! Okay, okay, enough browsing! Time to get focused and get what I need to get organized! Well, I’m pleased to say that I made it out of there with some very practical purchases including a black storage unit, a pegboard organizer kit and accessories, and a shoe organizer. Let me show you some before’s and after’s! 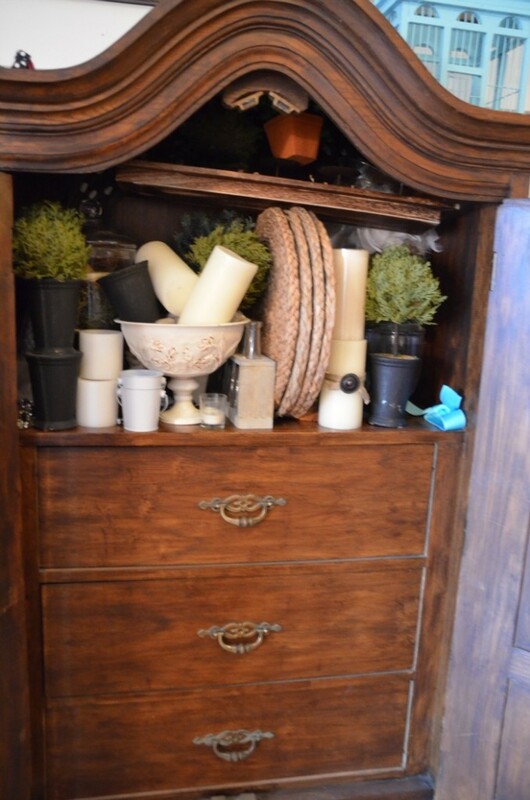 If you’re a home blogger, you might have an armoire full of accessories that looks something like this. This would definitely be a “before”. I could barely open the cabinet without something falling on me and the drawers were filled to the gills. This “system” of mine was clearly not working. I set up an inexpensive Lowes storage shelf in the basement and loaded it full with accessories. Sigh. Much better! Now I can “shop the house” without fear of being attacked by a falling pillar candle. And after hanging all of my pegboard accessories, here is the happier after! Do you know how thrilled I am to be able to locate a hammer, screwdriver, and measuring tape at a moment’s notice? Heaven I tell you! Then, I headed up to my craft room to put some final touches on the pegboard. It was in pretty good shape but needed a few more pegboard accessories. Here is the beautiful after! 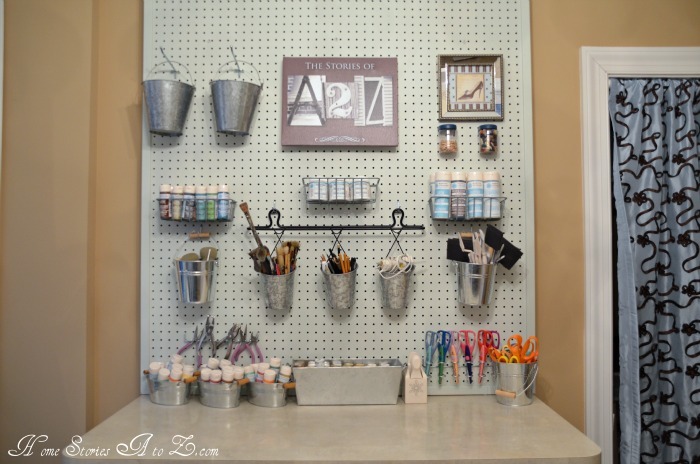 The pegboard baskets are wonderful to hold my paint supplies, textures, and mediums and the jar holders are brilliant for small item storage! And finally, here is my embarrassing shoe storage before. I purchased a cube organizer for my shoes and although it was a bit of a challenge to assemble out of the box, it was so worth it! I am thrilled with the more organized after! Why didn’t I do this ages ago? If you’re looking for more creative tips on organization, I recommend visiting the Lowes Creative Ideas page! Follow Lowes on their Creative Ideas Facebook page too! So how about you? Has the organization nesting bug bit you this month? Well, if not, maybe this will help! Lowes wants YOU to be able to put the fun back into functional too! To help you get your home organized Lowes is offering a $100 giftcard to one lucky recipient to spend at your local Lowes store. All you have to do is follow the direction in the widget below! Dis­clo­sure: I am a mem­ber of the Lowe’s Cre­ative Ideas Cre­ators & Influ­encers Net­work and received a Lowes gift card to com­plete this project. All opin­ions and expe­ri­ences are my own. Yeah! Totally made my day! 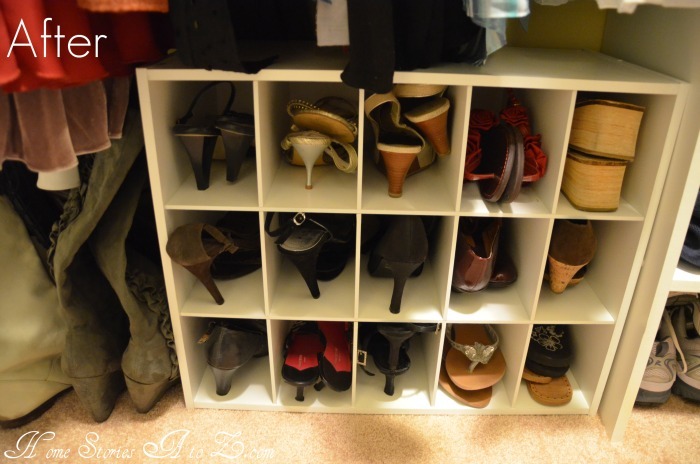 Love the shoe organizer….I need several of those! 5kids and not enough space, what doesn’t need to be organized! I have been living out of boxes since I recently moved back home to live with my parents. I need to organize the bedroom closet so I can fit my clothes and misc stuff in there. But before I can do that I need to remove all of my Mom’s craft stuff and put it clear plastic boxes so she can find her items when she needs them. I would tackle our office – it is crazy in here right now! We’d use it to start work on built-ins next to our fireplace to organize all of our books and decor! i really need to organize our big storage closet…yikes!!! Need to organize? Yes I do; no where to put most of my clothes; need storage areas. Our bed room….it’s a waste land of clutter and hubby clothes. He leaves them draped on everything. He is so weird! i have noticed a lot more organizing things at lowe’s! awesome! i did a shelf like that for my things and am so happy to be able to see stuff!! This would be great to win! We’ve been really short on cash and have a lot of home projects to take care of sometime… could do quite a bit with $100! There are so many that need to be done but my laundry/craft room need it the most. Sorry I did not answer the question. I need to organize everything. I love Lowes Creative ideas. 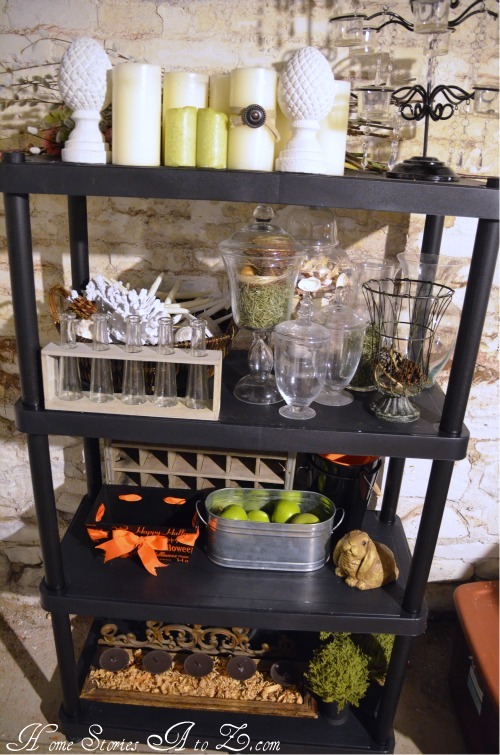 Lots of awesome options for storage! I definitely could use some of those bins and baskets at my house. As for a specific project – I have an office/desk that looks like a paper store barfed all over it. Stuff is just piled any which way and I can’t find anything. love the shoe idea at the door never thought about using it there….I so need organization right now if you only seen my house and since were doing a kitchen redo oh what a mess….Thanks for some great idea’s! awesome giveaway! I am SO in need of some major organization in my life right now!! Thanks for the inspiration! I too need some organization in my office and kitchen! I really need to organize my shoes. I’m seriously thinking about getting a couple of those shoe cubbies. P.S. The ad below covers the “submit comment” box in Firefox. I had to open it up in google chrome. 🙁 You can see the emphasis part, but not the box. My craft room! Things are still just stored in cardboard boxes and bins from where we moved in several months ago!!! I am currently trying to organize our garage and storage spaces. I would work on my craft room/spare bedroom. Having to work on getting creative with closet space to make the most of the room! Very inspiring! I love your craft pegboards! I need to organize my craft room!!! And my closets!!! Hi! I enjoy reading your blog but have never commented before. I had to though when I saw that I purchased the exact same galvanized bins and pegboard kit at Lowe’s just this past weekend! January is definitely the month to get organized. My garage is also in need of major organization. I wish I had a basement so that my garage wouldn’t have to do double duty. I have been working on organizing but have avoided the garage. It is next on my list. I would like to better organize my kids closet. I would love to tackle my laundry room. I have way too much stuff sitting on the floor. I need some plastic storage bins so I can get rid off all of my cardboard boxes. I would love some of the locker storage boxes too. Very cute! I need more organization everywhere really, but I think the top of the list is either the boys’ bedroom or the homeschool closet. I really need more storage and better organization in my kitchen! Where shall I start. We moved to a smaller home a few months ago and I’m still trying to find the perfect way to organize the basement, my studio, and several closets. I sure could use this gift card to organize my newly discovered love of crafting. I have GOT to tackle the organization in the kids closets and play room closets! They can’t even find what it is they want to play with! 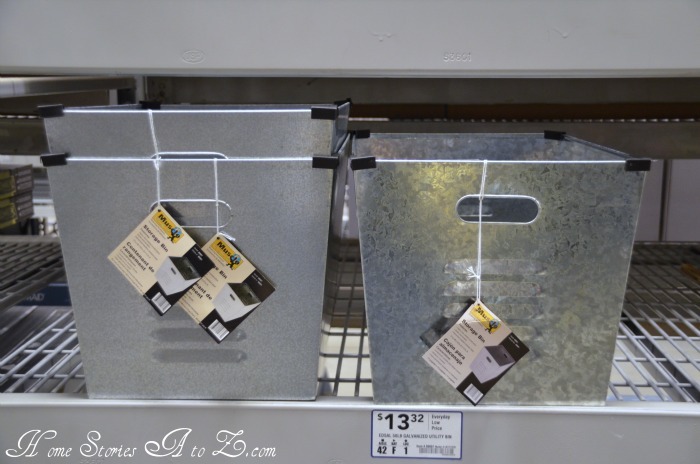 A $100 Lowes gift card would sure come in handy for many organizational projects in my home! Thank you both for the entry! 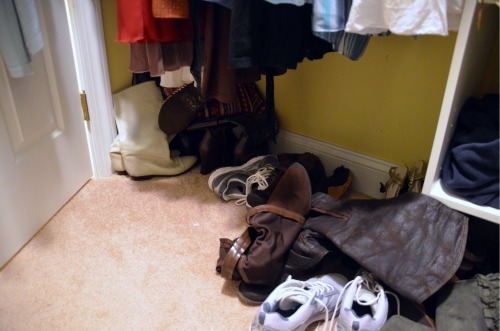 I need to organize my master closet…it’s a wreck! I really want to get my craft room organized so my little ones and I can get our craft on! I have 4 closets that need so much help!!! My husband and I will soon be moving so our whole life will soon need to be re-organized! This would be a great help for us! I love organization! I would tackle my laundry/craft room. I am at peace when every thing is in it’s proper place. I can’t even tell you how many rooms in my home that could benefit from some organization! I want to get my laundry room/craft closet straightened up! I want to create a pantry in my coat closet. I would love to organize my bedroom closet. (Actually, I would love to organize every room in my house) but by Bedroom closet needs some major TLC & would make my mornings so much better if it was organized. I love the shoe holder you have in your closet & your craft room looks great!! I really need to organize the closet by my back door. Pegboard baskets all the waY! I need to do some serious organization in my children’s closet. There are all sorts of things floating around in there. I need to do my 15 yr old bedroom. and it would be good to paint it before we do the closet and the hardwood floor. I’d like some of those storage baskets at Lowe’s for my pantry. I have started with my older daughter’s help in cleaning up/sorting/organizing our basement. It is a great space for playing and crafts, but it is in desperate need of help. My desk could use organization, piles of paper work every where. need to tackle the bathroom essentials cupboard. Taming the paper monster is the task at hand in our house! We need baskets & bins to manage school work, magazines, newspapers, in coming & out going mail, recipes, catalogs, etc. I would love to check out Lowe’s selection! working on my pantry. huge project to tackle but nearly done!!! 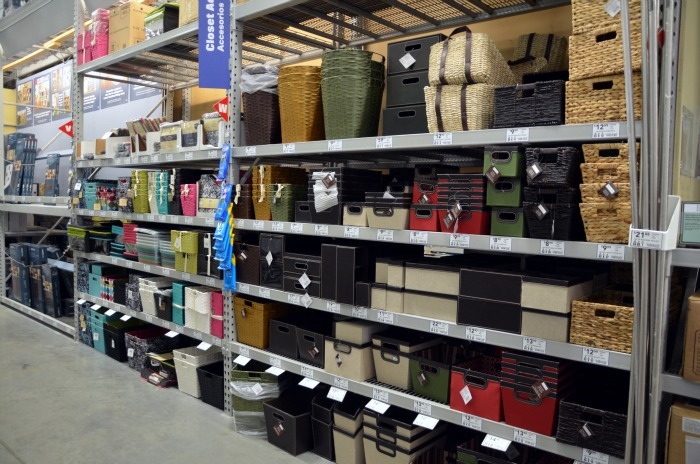 I’d love to win the $100 and buy some of the fabulous baskets and bins at Lowes!! I need to organize my office! I plan find a place to put some boxes of stuff STILL PACKED from our move in 2009 (yeah). And add some more hampers for laundry so it doesn’t end up on the floor–stylish ones I can keep out in places my family actually tosses their clothes. My craft room and my son’s room needs organized. Oh, heck, my whole house needs organized. A gift card would be AWESOME! Thanks! What don’t I need to organize at my house. I am a grad student earning a double Master’s degree and have a husband with ADD! Nothing is ever in the right place. If I had to tackle one first it would be my sewing room. I have way too many small containers filled to the brim and need to consolidate. 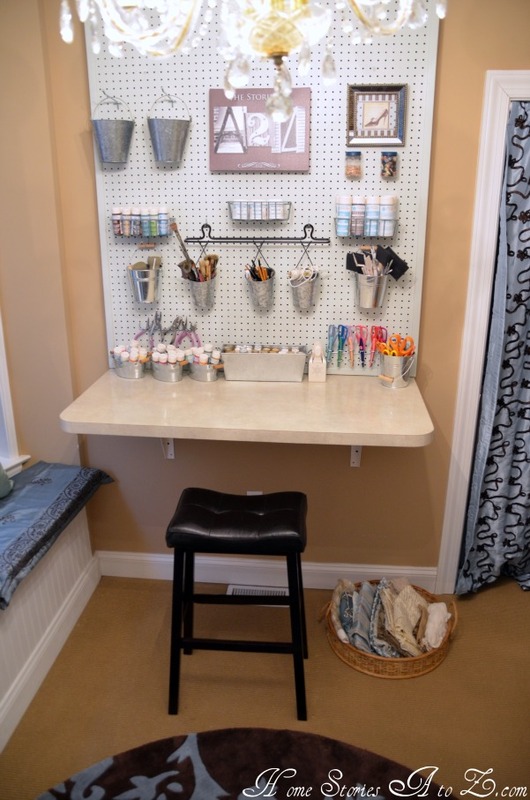 I want a craft room/space!!! I need to get my master bed room closet way more organized! This gift card would really help!! I really need to get the garage cleared out and organized. I’ve made decent headway with the living area …but that garage …sheesh! I need to organize my office room! I’ve been doing a whole house purge. Just feeling the need to get rid of a lot of “stuff”. So far, doing one room, just leads to more chaos in another room. But, I can see a difference already. This past summer my mother-in-law moved in with us. As a result, I have lost some space and need to do some reorganizing. I just picked out paint to begin redoing my entry way and need to buy some shelving and other “stuff” to reconfigure some space in our coat closet and a pseudo pantry. This would be a sweet way to begin this project! There is a lot of attractiveness going on in this post. Ummmmm, if I had to prioritize, we are making our downstairs in our raised ranch our bedroom so our 5 kiddos can branch out in the 3 bedrooms upstairs. I am trying to do it on zero cash repurposing what we have so I would love to win a Lowe’s giftcard! i want a new shower!! 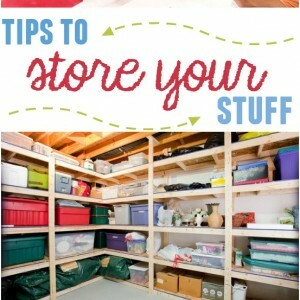 Organizing Craft room and Mud room are at the top of my list.. Love all the storage bins..! I need to get my girls’ closet organized. It’s awful!! My closet is in need of some SERIOUS help! My craft space could use some work as well. I have to finish painting my bathroom and cabinets! I would like to organize my sewing room! Oh, always trying to organize around here, seems like a constant battle. Would love to win! I could really use some help for our garage. I desperately need to tackle my laundry room. It’s become the catch-all and I can’t find anything anymore! I definitely need to tackle my sewing/craft room – it is screaming for some organization. which area to organize? 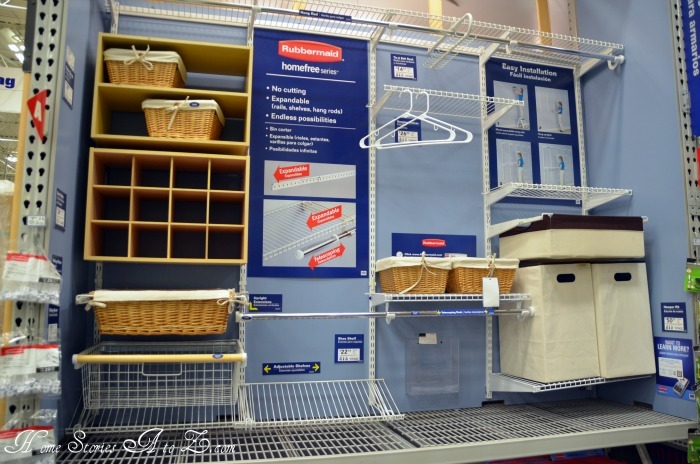 Lordy, they ALL need more organization & I LOVE Lowe’s – so this would be so perfect. I probably would use it for more storage in my craft areas. I need to organize our homeschool supplies and craft supplies. I need a ton of baskets/bins and would love some pegboard too. I’d probably go crazy with $100 at Lowes! I would organize our master bedroom! We just bought our first home less than two months ago, and the master is in need of some sprucing up. For starters, I would like to tackle my laundry room, junk cabinet in kitchen, my bedroom closet and garage. 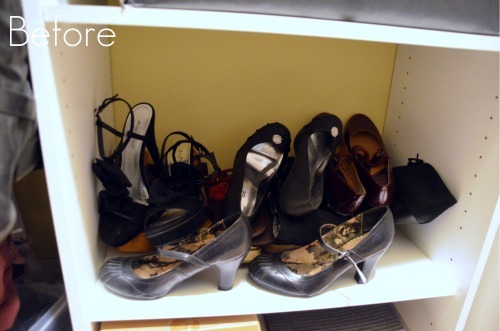 Where to begin….I am going to invest in the shoe organizer, that’s where I’ll begin! Thanks for the post! I would love to orga­nize my kitchen cab­i­nets — par­tic­u­larly our cook­ware stor­age. The garage! It needs to a “mudroom” area so badly! We just started a bathroom remodel and a gift card from Lowe’s would be very helpful when it comes time to buy supplies for organizing our updated space. I need to organize Carters playroom and all the toys! My kids closet needs some major organization! I would love to organize my craft closet and get some supplies to finish my kitchen redo. I’d like to organize my laundry room closet. It has been on my list since Christmas!! I need to just organize the whole house. I’ll probably start with the home office. I would love to get my bedroom organized but my garage really needs it. It’s bad and when I say bad….I mean BAD! I would love to complete my closet, I need a(some) shoe rack and more hangers. I could really use some storage for my son’s room. The toys are taking over. I need to get my basement organized! Toys, tools, work out equipment everywher! I really need to work in my linen closet. The towels and sheets are always falling out when we open the doors. ANNOYING! We’re moving! To a house with smaller closets. Nooooooo! I need serious closet organization. I really want to work on our front room, that has been empty since we moved into our house. 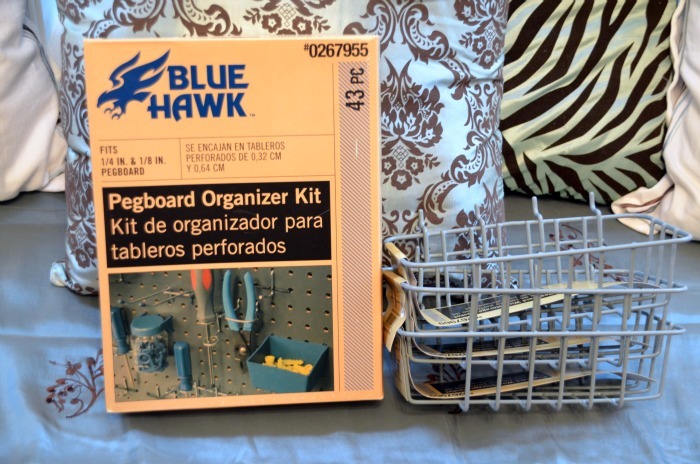 Need some ideas for sewing organization but loooove the pegboard ideas !!! Love what you did, Beth! I need to get control of my office! i need to work on organizing our closet! I want to create a scrapbook/craft nook in a closet in our guestroom. A gift card to Lowes would go a long way towards helping with that project! So many things that I could organize around here. Where to begin, crafts, closet, pantry, garage??? I’m in the midst of a massive clean out. Help would be appreciated. There are so many things I could organize if I won this card, between my kids’ rooms to my room. I would love to get better organizers in my little boys room cuz he has too many toys and they need a place to live. My girls’ room is still being redone and it would be fun to get their shelves finished and get their chandelier. Oh yea and the galvanized buckets/bin look is winner:) Looks great! My craft/office/paper armoire is on my list to organize and a gift card would be just the motivator! my sons room! its a disaster !thanks! I have a big lack of counter-space, so everything that needs to be kept away from my son’s little hands ends up on the table. I’m dreaming about installing a wide counter on one of our walls that can act as a buffet/coffee bar/landing spot. Thanks for the chance to win! Oh my goodness – I soooooo need to organize my “walk-in closet” – I call it that loosely (right now I can walk in it but barely). Also, need to battle that craft room downstairs! I love what you’ve done – looks fabulous! Thanks for the fun giveaway! Oh, how fun! My craft area is in desperate need of some organization!! I have stuff all over my table, under the table, on the floor, in old suitcases…it’s a mess! Would be fun to get it cleaned up and easier to find things when I am doing a project. Thanks for the giveaway!! I desperately need to organize my sewing stuff. Its in piles on the floor of my closet. ugh. I have tons and tons of magazines to organize and need a lot of those big bins and baskets. I already have them all in chronological order, but until I can put them away in an organized manner, they’re not going to *stay* very organized and accessible. need to tackle my office/studio space! My whole house is crying out for help!!! I need to organize the kids area. I would love to tackle my school room/craft room!! It’s a mess! An organized shoe closet would be a dream!! I want to win. I’ve done a ton of basement organizing but I could always use more! This is so exciting. I have a closet under the stairs and a space in the kitchen that i am working on turning into a command center. This would definitely speed things up! My basement is the worst! Definitely in need of organization! I would love to tackle my bedroom. It is messy and unorganized. I would love to organize all the mail, papers, magazines and everything else that collects on the end table and coffee table in the living room of my little apartment. My office closet could definitely use some better organization. These pictures have me thinking I need to get busy! Thank you for the post and giveaway. I want to organize! And I need it bad – pretty much every storage space in my house has turned into a big ole mess. I have wire shelving aaah! 🙁 I need to get my craft/bedroom closet in order! I would love to create some before and after shots! There would be some organizing I could do! I’m in organization mode too! Just finished our closet and moving to our laundry room! I need to tackle my daughter’s closet..might have to use the dreaded wire closet organizer though due to cost. I really need to tackle my craft room. When we placed the phone jacks and such in our new house, we had not yet designed our library bookcases. They turned into a custom builtin desk, which is great, but there’s no jack there, so we can’t hook up our desktop (tat serves as our server for the wireless). So…my craftroom has been more office. I want to move the computer out and get going on that room finally! boy do I need a shoe organizer! love your blog! The entries in the rafflecopter are under my Google name, Mami2jcn. We are building a new house this year & I can’t wait to start over redecorating & hopefully starting out on the right foot with organization. The kid’s clutter is taking over our current home because we only have one main living space. I’d like to reorganize my garage. It needs it desperately! We just built a new, giant, walk-in closet for our oldest daughter. Right now it is a blank canvas, but I can’t wait to get to Lowe’s to decide which closet system will grace this lovely space. Between that and organizing my kitchen desk (I loathe kitchen desks), Lowe’s will be seeing a lot of me this month! I need to organize my whole kitchen better!!! I really need to put new floors in my kitchen! 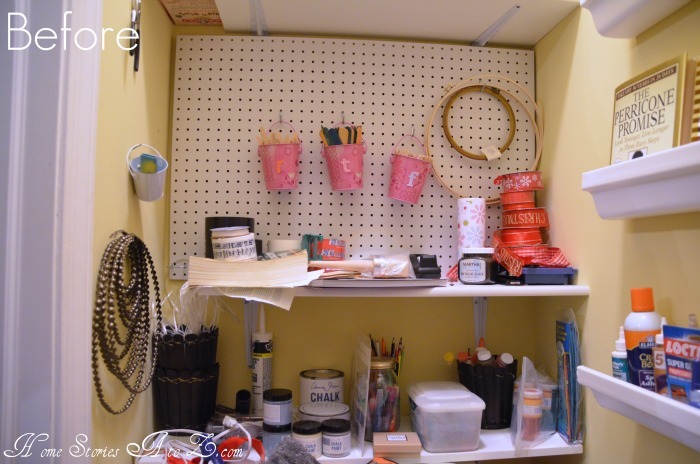 I would love to get a huge pegboard for my craft room so I can actually see what all I have! I need to get my craft area more organized, so I would get some shelving. I recently moved from a house to an apartment and am in the middle of a huge downsizing. Organizing is my only hope especially my craft supplies. Thanks for a chance to win. I don’t even know where to start! My desk is atrocious, but the nursery needs a makeover too. I would tackle my laundry room.Have the pegboard just need the accessories. I’d love to get our basement better organized…it’s a little bit family room, a little bit craft space, a little bit laundry room, and a little bit storage…ONE BIG MESS! Since we have a new (to us) house and 3 small children (one is 28 days old!!) I’d love to organize about every inch of my house….$100 would be a great start!! I need to organize my laundry room! The gift card would be great! I would really love to tackle our garage! Can I say everything in my house needs to be organized!!! I would mostly focus on my daughters bedroom and having storage for all of her clothes and toys that just get scattered everywhere! Thanks for the giveaway! definately need organizational assistance in my craft/sewing room! Love how you used the peg board! I am inspired for my kid’s rooms! Thanks! A big reason I started blogging was to be more organized. I have this vision of all home bloggers being super organized. I’m excited to tackle a closet myself! I have the icky wire shelving in my kitchen pantry. I would love to be able to take those out and put something more efficient in there! Currently everything falls through the spaces. SHOES!! I need a good way to organize my shoes!! I have that shoe organizer and LOVE it! Now to find something to organize all of my boots! Love all of your before and afters. I have been working hard around our house to do some organizing! Thanks for sharing all of your great ideas! I need to organize the closet in my boys’ room. Our bathroom extras and the kitchen spice/baking area are tied at a very close second place. I need to organize the playroom, bad! I could really use some supplies to help me organize. Organizing was the plan this month, but I just don’t know where the time has gone! I did clean out two closets, but never finished the rest of the house. You’ve done such a great job! We’re creating a new pantry space and definitely need some organization in there! Oh my, I so badly need to organize my pantry. Something falls down on top of me every time I open the door! Argh. My laundry room is the ugliest, weirdest-shaped room in the house. And the door is always open. I’d give it the maximum face lift possible. My garage and bedroom closet are in desperate need of organizing.Gee, so is my pantry and kids closets and laundry room… sigh. My laundry room needs lots of help! PEGBOARDS!!! Thats EXACTLY what I need!!! I never think about that as a storage option!!! thats probably how I would spend the giftcard!! I would love to use it on my downstairs living/craft room. I’d love to get my craft room set up and organized! yay lowes! I need to organize my mud room, sewing room, bedroom, and kids rooms. 2012 is the year for me to do it!! I want to say my craft room, but honestly, my kitchen is more of an unorganized mess – so I’ll go with the kitchen!! 😀 Thanks for the chance! I so NEED all the organization help I can get. Would love to tackle our main floor bathroom! Thanks for the chance to win. We are about to tackle our garage and this would be so helpful!!! craft room, kids play area, pantry, um….pretty much my whole house. Great blog and giveaway!!! There are pockets of space all over our home that need help. I think my little art studio and the boys’ playroom are in need of the most help. We’re headed to Kenya for two years (at least) and we’re selling our house. So everything we own has a descision attached to it. Do we take it, sell it, store it or toss it? So I have some MAJOR organization to do in the coming months! Thanks for the chance to win! I just moved into a small apartment (college student!) with very little storage space. The first place I would start is my kitchen! No pantry, very little cabinet/drawer space…I need some creative organization STAT! Today I promised myself I would start my master bedroom closet. Its a disaster…most of my bedroom is. Why do we always leave ourselves for last? I need to organize my craft room. 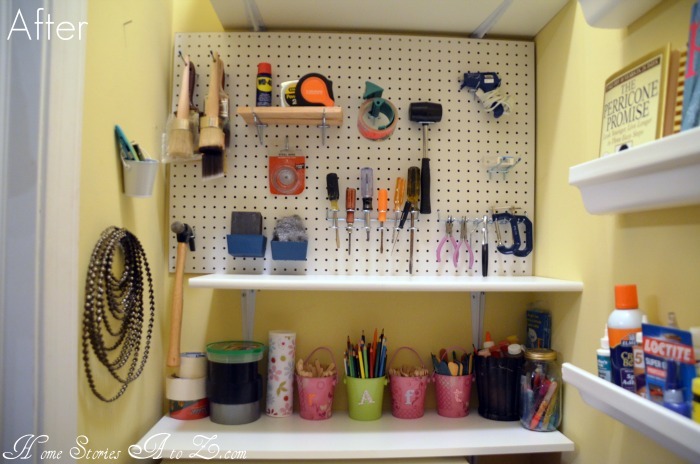 I love the pegboard idea! I would love to win one to organize my laundry room, or pantry, or closet. Tons of ideas, just not tons of money. I LOVE the shoe organizer! I NEED that bad! I would love to further organize our garage, as well as my craft area.I too love the galvenized buckets and boxes. I would continue to get my garage AKA my studio organized, but also need some things for our master bedroom closet! My unfinished basement needs to be organized, it’s a dumping ground! It is such a mess. Its become a dumping ground for everything that doesn’t have a place in the house. I need some shelving units, totes and hooks. I saw an awesome storage system on Pinterest where there were totes stored in a system on the ceiling. I would love that! My shoes look like your before!! I want to organize my closet! I could use some new shelves in my storage area and I love to use baskets in my pantry. I totally need to organize my craft room! I want to get my garage & craft/work space better organized! And maybe my closet too!!! !